One of the most anticipated CD debuts of 2012 comes from Canton Junction. After the insane buzz from their live rendition of “Sweeter As The Days Go By” (see video above), this new group has a lot of pressure to deliver on their debut project. After listening through the project, it is safe to say that this new group is going to make a major impact on the Southern Gospel circuit. Below are our thoughts on this new project. BRIAN: It’s not often we get debut albums (typically only once per group), so when we do, there is an air of anticipation. Because of the star power of the individuals in the group, Canton Junction’s debut has caused more anticipation than most. The individual members come from a variety of backgrounds within gospel music, so it’s not a surprise that their debut recording draws from many backgrounds: there are a some southern gospel standards, a few hymns, a dash of country, a couple from the P&W/contemporary arena, and even three drawn from the easy listening American songbook. 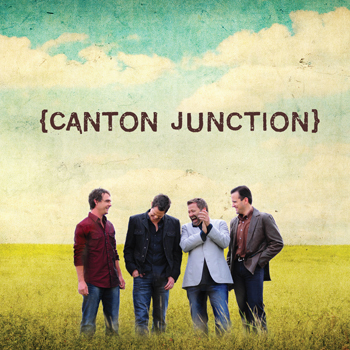 Canton Junction has an excellent, thick quartet blend that serves them best on hard-driving songs with a country lean. “Sweeter as the Days Go By,” “I Wouldn’t Take Nothing for My Journey Now,” “Dig a Little Deeper in God’s Love,” and “Go Tell It on the Mountain” are examples of this, and are among the strongest cuts in the 2-disc set. The bluesy Gerald Crabb/Karen Peck & New River cover “Hold On” is another strong track that shows what this quartet is capable of with a southern gospel style. Individually, Tim Duncan is the member with the most quartet experience, so it’s no surprise that some of the strongest songs feature him, including “Sweeter” and the Gaither classic “Going Home”. I would expect Canton Junction to lean on him early on as they seek to gain a strong foothold with southern gospel fans. Though they are at their best on the hard-driving songs, Canton Junction shows enough versatility to tone it down for songs like the Dottie Rambo classic “In the Valley He Restoreth My Soul,” which is one of my absolute favorites on this recording. They also do an admirable job on the hymns, my favorite of which is “Softly and Tenderly”. Though the songs are produced and performed well, Canton Junction will lose the attention of traditional southern gospel fans like me when they switch over to P&W stuff like “Glorify” (I think I counted eight choruses). The three secular songs are a negative for me, particularly “You Are So Beautiful”. Squeezing a “Lord” into the lyrics to attempt to make a love song into a gospel song is a big no-no for me. There is certainly a market that Canton Junction will appeal to with the less traditional stuff…I’m just not in that market, personally. If Canton Junction split the tracks up so that one 10-song CD contained “I Wouldn’t Take Nothing for My Journey Now,” “Hold On,” “In the Valley He Restoreth My Soul,” “Dig a Little Deeper in God’s Love,” “Going Home,” “Since Jesus Came Into My Heart,” “Who Am I,” “Go Tell It on the Mountain,” “Softly and Tenderly,” and “Sweeter as the Days Go By,” that CD would get an easy 4.5 stars. As their debut is actually composed, there are a few too many reaches for the skip button for an old-school quartet fan like me. Still, this is an impressive debut that shows the great potential of gospel music’s newest quartet. ADAM: “Where Good Things Come Together” is the slogan for this new quartet and it simply fits. To be honest, there hasn’t been much in the Gospel music scene that has really spurred my attention lately. However, when the video above first surfaced on the ‘net, I felt that finally there was something interesting happening in the SG arena. communicating the music and message of Jesus. After listening through Canton Junction’s debut effort, one can easily recognize the measure of talent that this combination of men has pulled together. The vocals, naturally, are top-notch and is what you would expect from a lineup like this. Any project with Michael Sykes at the helm in the studio is going to deliver excellent production in every aspect from Music & Vocals to Mixing & Mastering. Songs for the Canton Junction are a blend of traditional hymns, new songs and Southern Gospel standards. The styling of the music ranges from Easy Listening, Contemporary, P&W, Country and Southern Gospel…there’s a little something for everyone’s musical palate on this CD. The only style I feel that was really missing was full-out quartet singing. Personally, I would have loved to hear a song or two with each part featured, but the lack of this style certainly doesn’t detract from the listening experience. Highlights are abundant from this project and too many to try to name them all. ‘Coming Home’ and the live cut of ‘Sweeter As The Days Go By’ are my favorite cuts (so far). Although most tracks are great, there were a few that I have already unchecked from my playlist so that they will skip. ‘You Are So Beautiful’ and ‘What A Wonderful World’ just didn’t do anything for me, but I imagine that several people will enjoy them. Go ahead and add “Show Me Your Way” to my top picks from this CD….Awesome!